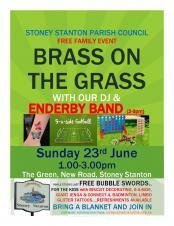 Stoney Stanton Parish Council provides YOUR local services. Our website includes a wealth of information about how we conduct business and what we do. Use the search or browse the site to find whatever you are looking for. If you can't find what you want or would like to recommend any improvements to our website then please contact us. Stoney Stanton Parish Council cares to ensure the security of personal data. We make sure that your information is protected from unauthorised access, loss, manipulation, falsification, destruction or unauthorised disclosure. This is done through appropriate technical measures and appropriate policies. Stoney Stanton Parish Council does not use automated decision making or profiling of individual personal data. FUN FOR THE KIDS WITH GARDEN GAMES, 5-A-SIDE, GLITTER TATTOOS, BISCUIT DECORATING AND MUCH MORE. ENTERTAINMENT STARTS AT 1PM WITH OUR DJ AND ENDERBY WILL BE PLAYING 2-3PM - COME AND JOIN IN. Blaby District Council have opened their new website and some of the links on this website are waiting to be updated. If you need to contact Blaby please click the link. HTML5 validated. WCAG compliant. Page generated in 0.1466 seconds.